Last Year, ten members of St. Patrick’s visited Stewart Detention Center with John Ray. This Detention Center is in Lumpkin, GA. It was built as a prison but operates as a privately owned detention center for immigrates, but in a prison atmosphere. Most of the 2,000 or so men are there by reason of trying to come into the United States or driving without a license (because they are not allowed to have a license.) They are from all places of unrest and speak English, French and Spanish. 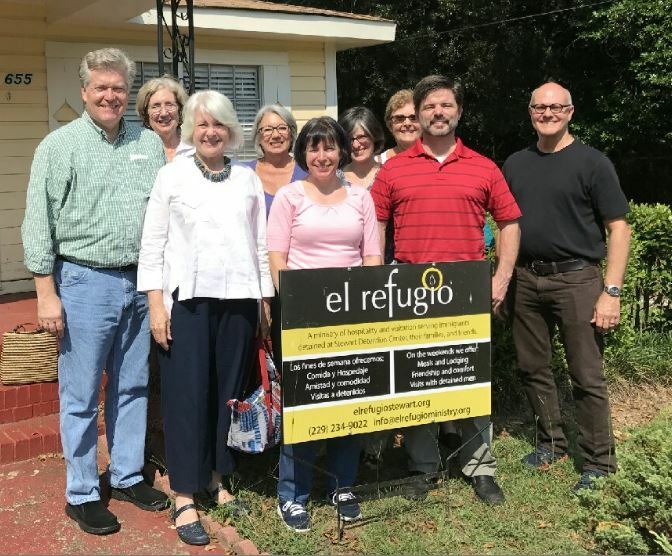 El Refugio, a welcoming house for families, was our contact when we visited and they helped to arrange our visit as well as introduce us to the system at Stewart. We would like to send the volunteer staff at El Refugio cards which they can then distribute to different detainees who have requested letters. There will be a table in the Narthex for the next two Sundays for the purpose of writing words of hope and encouragement and faith. Please come make one if you are so called.